We believe in transparency. It is important to understand the ALL IN dumpster rental cost when comparing service providers. Flat Rate includes 10 day dumpster rental, pick up/removal of the container, and disposal of waste material up to the pre-established tonnage allowance. Additional disposal charges may apply for tonnage in excess of the allowance. Fuel and Environmental Fees - In our experience, we see industry fees that are out of control running between 12 to 24% nationally. We charge less than 10%. 90% of the time your dumpster rental needs will fall into the general waste category. Trees, stumps, shrubbery and organic materials. Dirt, concrete, brick or block and other aggregated material. Recyclable material (i.e. wood, metal or cardboard). 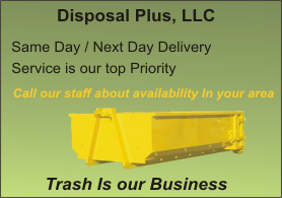 Call for pricing on waste streams that might require special handling. Appropriate for a small basement or garage cleanout; removing a 250 square foot deck; removing 1,500 square feet of single layer roof shingles; yard debris cleanup, or a small kitchen and bath remodeling job. Holds approximately 5 pick-up truck loads. The most commonly used dumpster, appropriate for most projects, including new construction, smaller demolition projects, roofing material, most home renovations, estate cleanups and home clean outs, landscaping, recycling, and land clearing. Appropriate for a major home addition; construction of a new home; demolition of a garage; or entire house window or siding replacement for a small to medium size home. Appropriate for window or siding replacement for a large home; commercial roof tear off; commercial cleanout; new construction or major addition; large amount of trash, paper, or cardboard.